1 Why Should You Use a Hammock Quilt? 2 What Is a Hammock Quilt? 3 What Are the Benefits of Using a Hammock Quilt While Camping? 4 What Are Main Features of Hammock Quilt? 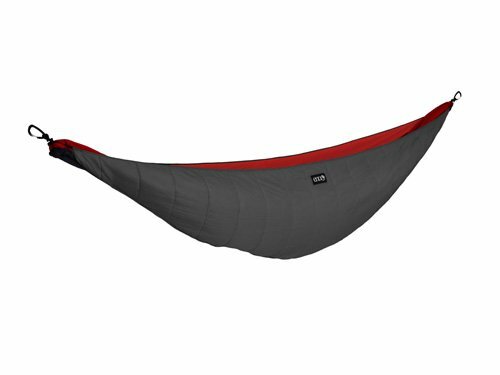 5 What Are Top 5 Hammock Underquilt? 6 How Warm Does a Hammock Quilt Keep You and at What Temperature Should You Add an Underquilt? 7 What Types of Hammock Underquilts Are Available in The Market? 9 How Is a Hammock Quilt Useful? 10 How to Attach an Underquilt to A Hammock? 11 How to Hang a Hammock? Why Should You Use a Hammock Quilt? To understand why you should be using a Hammock Quilt, you should first understand what a hammock quilt is. Some of you may already know how easy and convenient hammock camping is and already have used a Hammock Quilt. If you are just beginning to explore how easy hammock camping is, you may have noticed it is a bit difficult to keep your backside warm in a hammock when the weather cools down, even with a regular sleeping bag. In this article, we cover what a Hammock quilt is, what they are typically made of, basic weather and usage information and the pros and cons of different brands of Hammock Quilts. What Is a Hammock Quilt? A Hammock Quilt is a sleeping bag that wraps completely around the outside of a hammock. Similar to a suspended cocoon. The Hammock Quilt does not directly touch the hammock; however, is a barrier between you and the ground cold. Body heat is maintained within the quilt (depending on insulation/brand) from cool nights of forest camping to freezing temperatures in the snow. Hammock Quilts generally come with the ropes and hooks needed to attach them to most standard size hammocks. A hammock is needed to use with the Hammock Quilt. What Are the Benefits of Using a Hammock Quilt While Camping? A Hammock Quilt provides a warm and cozy night’s sleep. Hammock Quilts are designed to block the cold coming from the ground while camping. A Hammock Quilt also keeps in your body heat because it wraps all the way around the hammock in a cocoon style. Have a sound night’s sleep while camping in an off the ground shelter such as the Hammock Quilt. A Hammock Quilt is a lightweight option. A good Hammock Quilt can replace a sleeping bag, ground pad (for warmth) and even a tent. If you are hiking to your destination or have limited space to pack your gear for a camping trip, a hammock and Hammock Quilt are a great solution to your space and weight problems. Hammock Quilts are very easy to set up. Once you have set up your hammock, the Hammock Quilt simply wraps around your hammock and is attached to both ends of the hammock with hooks that come with the Hammock Quilt. A Hammock Quilt offers more versatility for your camping adventures. Camp anywhere you can hang a hammock. Enjoy the freedom and the view. Enjoy nature even more while lazily hanging out in your hammock and staying warm with a Hammock Quilt. If you want to go for camping because you love fresh air and want to enjoy the open nature, choosing hammock is just perfect option for you. By sleeping in a hammock, you will get the gentle breezes from the mother nature. It would be the best feeling when you will fall asleep counting the stars. What Are Main Features of Hammock Quilt? – The materials used to make a Hammock Quilt vary but should all achieve the same outcome of comfort, warmth, lightweight for carrying and typically water repellent. Lightweight – All of the material used to make a Hammock Quilt is of a lightweight design, typically not weighing more than a few pounds’ total. Space – Hammock Quilts can be compressed for hiking and travel purposes and take up much less room than a conventional sleeping bag. Nylon or Cotton– Hammock Quilts come made either/and nylon and cotton exteriors. Because nylon can dry faster or even be water proof, that would be the preferable material. Moisture Resistant– The underside should be made from a durable, rip proof fabric similar to a lightweight tarp that can resist water or even have a Durable Water Repellent coating. – The kind of weather and conditions you are going to be camping in should determine the type of insulation you should look for in a Hammock Quilt. Because a Hammock Quilt should not really be touching your body, the heat dynamic created within it is a bit different than a sleeping bag. The insulation materials are very lightweight. Down Filled – A very effective insulation and an old time favorite. Synthetic – There are a number of different types of polyester insulation fillings that are very effective, among them is the camping favorite – PrimaLoft. – Hammock Quilts come in a variety of sizes for fit to your hammock, you and varying lengths for temperature comfort. Fit to your body – Generally Hammock Quilts come in two body sizes; full length or torso. Torso – Will keep your body warm, your feet will be a bit more exposed. Full Length – Covers you from head to toe. Fit to your hammock – Camping hammocks come in a number of sizes, including double size camping hammocks. Make sure you have the right size Hammock Quilt for your hammock. – All Hammock Quilts should be relatively light, but even ounces can make a difference on a long hike. – Just like sleeping bags, Hammock Quilts are rated for temperature use and season. Moderate to Cool Temperatures – A Hammock Quilt will easily keep you comfy in cool spring and fall nights. Freezing Temperatures – There are Hammock Quilts rated for very cold weather, the addition of a hammock underquilt can also make a Hammock Quilt considerably warmer. 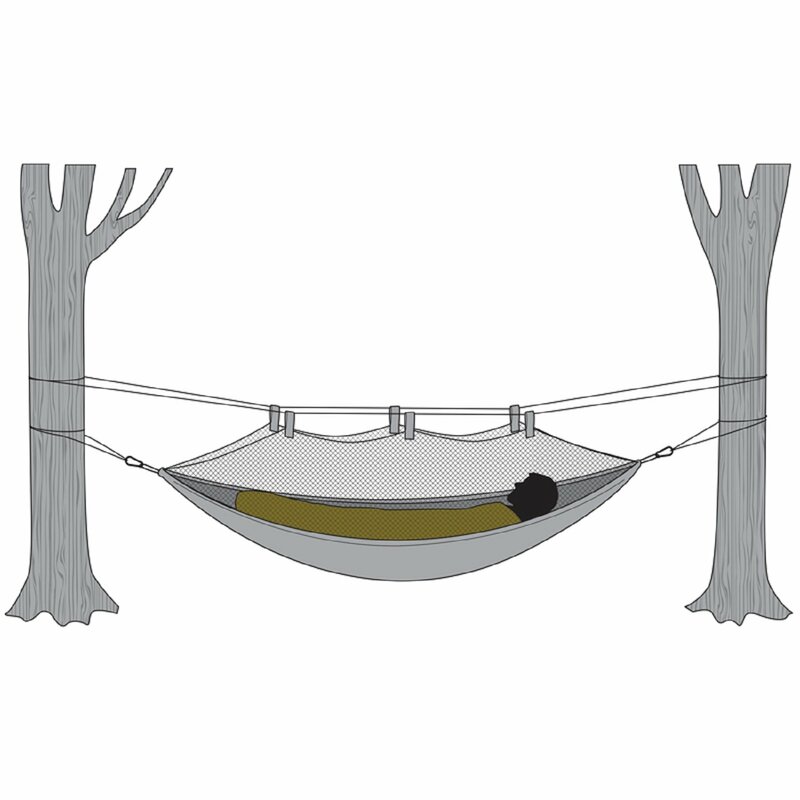 Hammock Underquilt – This is an additional pad that can be added into the bottom. – Depending on the materials used to make the Hammock Quilt, the use and care, it should last a number of years. – If you are camping in freezing temperatures, a hammock underquilt is highly recommended, in addition to a Hammock Quilt. The additional barrier between ground temperatures can mean the difference between resting and having a good night’s sleep. 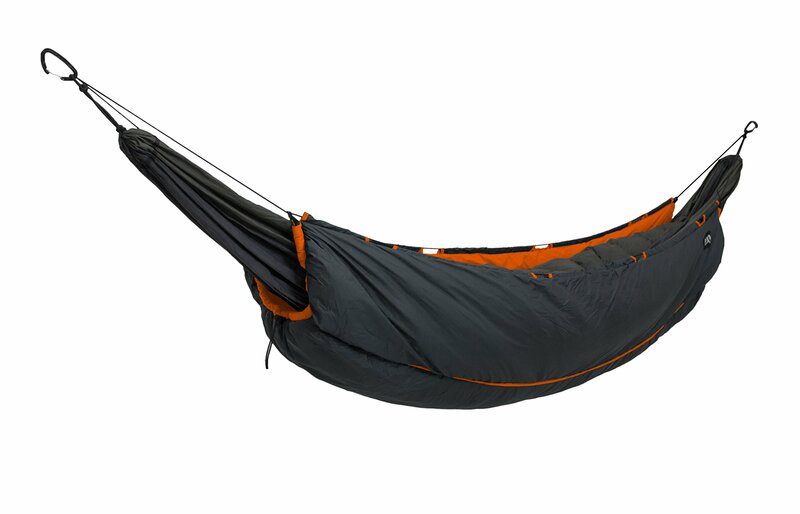 What Are Top 5 Hammock Underquilt? The Snugpak Hammock Under Blanket is a great budget camping option. If you are a weekend warrior camper or just a casual camper, the Snugpak Hammock Under Blanket is a good choice. 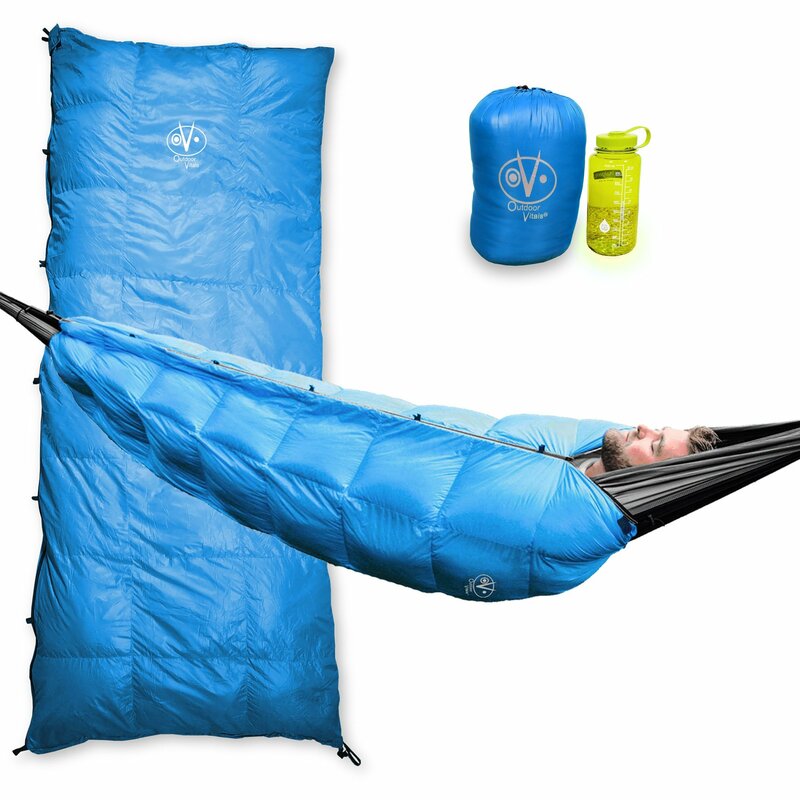 Made of heavier materials than the other Hammock Quilts mentioned, this would not be the optimal choice for the long haul or the dedicated light hikers. The Snugpak Hammock has not temperature or season rating. Likely the best budgets buy for the not so serious or beginning hammock camper. The Snugpak system does make you feel more snug. Heavier than the other Hammock Quilts. Known for making some of the best quality camping gear, OneTigris is new to the Hammock Quilt scene. Although this is their first Hammock Quilt, OneTigris has created a quality product. The TigresOne is rated for a temperature low of 40° degrees and should be considered a great 3 season Hammock Quilt. The lightweight insulation used is SEE Polyester Filling. The See Polyester filling is not only lightweight, it also compresses to very small dimensions making it easy to pack and carry just about anywhere. Rated for 3 season use with a low of 40°F. Because of the stitching this Hammock Quilt can sometimes catch a draft. Does not contour to the body like other Hammock Quilts. The Ember 2 Under Quilt is another Eno Hammock Quilt that is rated for 4 season use. However, it should be noted that the Ember 2 Under Quilt only has e a low temperature rating of 50°. The filling in the Ember 2 Under Quilt is made from polyester. Although not as warm as PrimaLoft, this Eno is sufficient for a cool summer night or the other seasons as they meet summer. If camping in a colder climate the addition of a sleeping bag can make a huge difference, but that would be added weight. Great value for the casual camper. The nylon shell has a Durable Waterproof Coating. Only has a temperature rating of 50°F. Might require additional sleeping bag for added warmth. Easily one of the top contenders for most packable is the Outdoor Vitals Aerie. It is made of extra light weight material and can compress down to the 9 x 7 inches. The 800+ fill down makes this Hammock Quilt super warm and compressible. The very unique design of the Outdoor Vitals Aerie has more than one purpose. It is made to work in a number of ways; as a underquilt for insulation, a sleeping bag, a camping pod, and can become a sleeping bag if needed. There are all kinds of added features to the Outdoor Vitals Aerie that put it in the next level of Hammock Quilts. The Outdoor Vitals Aerie is made from quality materials that include; XYZ zippers, DWR to keep water out and a unique suspension kit. The Outdoor Vitals Aerie 30°F Down Underquilt lives up to its name and easily keeps a camper warm on a cold night with design and down insulation. Larger than most other Hammock Quilts. Rated for temperatures as low as 30°F. Easily compressed down to the size of a football. Requires additional cord for the set-up of the underquilt. Does not come with its own sack. The Vulcan Underquilt furnishes inner heat under the coldest circumstances. The Vulcan was made with all four seasons in mind. The Vulcan is as comfy as other Eno underquilts with down insulation. Because of the Vulcan’s differential cut construction, it keeps the drafts out. The differential cut creates a cocoon shape, which contours closer to the body and keeping heat in. The synthetic materials used to make it work well and keep heat in. The construction allows for the Hammock Quilt to fit to the contour of your body. Durable Waterproof Coating that makes it perfect for any kind of weather. Compared to other equally rated Hammock Quilts, the price for the Vulcan Underquilt seems a bit high. Weight to product performance compared to down filled Hammock Quilts could be questioned for the pro camper/hiker. How Warm Does a Hammock Quilt Keep You and at What Temperature Should You Add an Underquilt? Most Hammock quilts should make you warm down to 50°F. Hammock Quilts rated for below the temperatures of 50°F and above 30°F likely have any additional underquilt needed included in the system or one can be added. For temperatures below 30°F an underquilt is very highly recommended. For temperatures 50°F and above, it is unlikely an underquilt will be needed as ground temperatures in those conditions likely won’t be very cold. What Types of Hammock Underquilts Are Available in The Market? Down is a great choice, as it keeps you toasty and you will be able to compress it to a smaller size, which is very helpful when you are camping outside. Down has its drawbacks though. In case it gets wet, its performance is significantly reduced and in muggy weathers, where you are not able to dry it out, it can become unusable. Despite this, for its insulating capabilities & lightweight design, it’s still the ideal option for underquilts for lots of hammock users. In dry conditions, synthetic underquilts aren’t as comfy as down. Also, they’re harder to carry and you will not be able to compress it into a small size. However, they’re very cheaper than the down hammock underquilts. Down hammock underquits might sound luxurious but you have to do a lot more work in order to keep it clean. If want to purchase an underquilt and a top quilt, then down can be very expensive for you. So, if you are on a budget, synthetic hammock underquilts will be your best option. Underquilts come in three sizes that can make a huge difference in your camping experience. The length of the underquilt is one way to regulate the level of warmth inside a Hammock Quilt. The size and weight of your underquilt can impact the size and weight of your overall load and should be considered for long haul hiking/camping. Although the it doesn’t seem like much added bulk, the difference in length on your underquilt is not just about warmth. Full Length –This size stretches across the whole length of the hammock and is by far the best choice for winter campers. The full length hammock underquilt is the warmest size. Three Quarters Length -This size is perfect if you are camping in a variable temperature situation that can get cold. To make up for any heat loss, most people just wear heavier socks. This option can shave off some of the bulk in your pack. 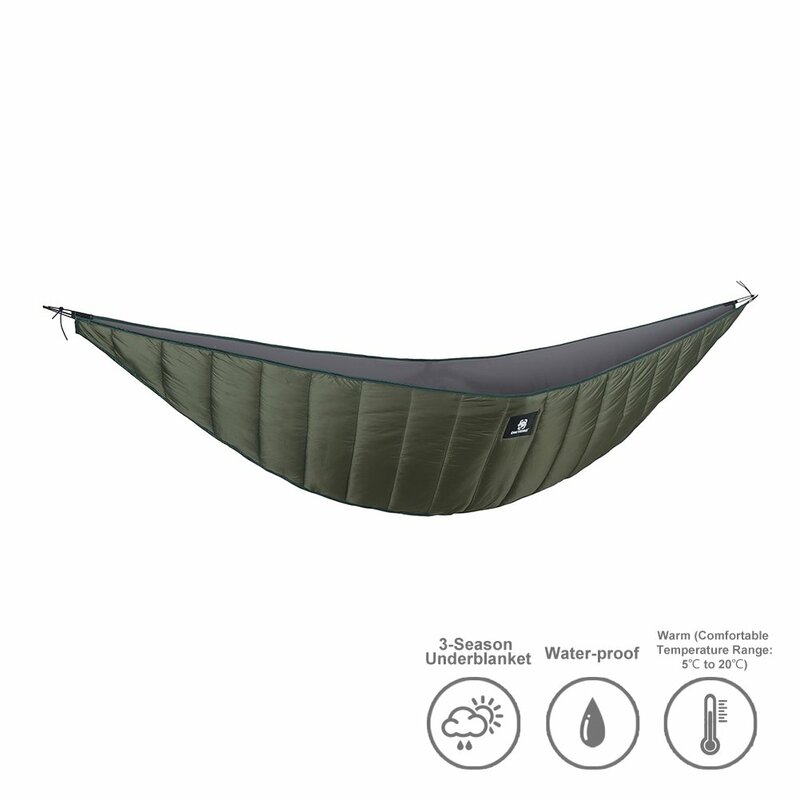 Haft Length -This is the best choice for the ultra-light camping enthusiasts and not recommended for temperatures below 30°F without additional insulation of some sort. How Is a Hammock Quilt Useful? You likely have already discovered the joys of using a hammock to camp instead of just a sleeping bag for a number of reasons. For all of those reasons and more, you should consider the benefits of using a Hammock Quilt with your hammock when sleeping outside. Traps in heat – Creating a barrier between you and the ground and then around you in a cocoon fashion, a Hammock Quilt effectively traps and preserves heat within it. No compression – No more sleeping on the hard ground or using a pad to create a barrier to the ground cold. A Hammock Quilt hangs underneath the hammock and does not impede the more relaxed position a hammock provides. Adjustable insulation – The insulation in a Hammock Quilt is easily adjustable by either removing the underquilt, using a smaller size underquilt or simply opening the top to let cooler air in. Large coverage area – Hammock Underquilts cover the length of the hammock and also the entire length of a person’s body, allowing a person to be completely covered by the Hammock Quilt to maximize warmth and protection from the elements. Fit evenly around your body – Most Hammock Quilt stitching and design is meant to wrap around you evenly from head to toe. More than one person can share the Hammock Quilt – Just like there are two person camping hammocks, there are two-person Hammock Quilts. Double the heat. How to Attach an Underquilt to A Hammock? For the most part it should not be too difficult to attached your Hammock Quilt to your hammock. A few additional camping ropes, S hooks or mitten hooks may be needed. Attach the Hammock Quilt to the hammock the hammock suspension cord at each end of the hammock and cinch tight. Make sure the Hammock Quilt has the bottom side under the hammock. Wrap the top of the Hammock quilt over the hammock and secure. Make sure you follow your manufacturer’s instructions and always carry extra carabineers when using a hammock sleeping system of any sort. How to Hang a Hammock? Hanging a hammock can be a tricky thing. Not only do you need to find a spot to hang it from, the way it is hanged can make all of the difference to a good night’s rest. Determine the two points you are going to hang your hammock from. Be sure the two points are not too far apart to prevent sagging in the night. Be sure you have secured your hammock. This is especially important if you are suspended from a significant height or over something you don’t want to end up on or in, like a stream. Hang your hammock slightly diagonally so that your head is higher up than your feet. This will allow you to sleep in a healthier and more ergonomic manner. Getting the most from your investment and keeping your Hammock Quilt in good order comes from cleaning it and storing it properly. Clean regularly. Wash in a machine if the manufacturer recommends it. Wash by hand if not. Do not store compressed in a bag, this can damage the insulation and cause it to be less effective. Try hanging your Hammock Quilt. If you are already using a hammock for camping, a Hammock Quilt is the next level for you. Don’t lose any sleep because you are cold or exposed to the elements. Snuggle up and make the most of your adventure by keeping warm in and using a Hammock Quilt. My name is Melody Asistin, account manager at Skonzig, a garden, and an outdoor brand. I really like your Instagram channel. It looks fun, attractive and really engaging. I think we could help you add more value to your audience by providing you our product (for free) for review and also give your audience some special discount/ or some fun contest…etc. We have a range of outdoor products including single and double parachute camping hammocks and natural mosquito repellent bracelets. If you are interested, please reply to this email and we can work out how to best cooperate. The above information is flawed. There is no way that #4 Outdoor Vitals Aerie 30°F Down Underquilt weigh’s 71lbs.. Nor does the Snugpack weigh 41lbs.. And that’s just at a glance… Also I have several of the Aerie’s and they all come standard with their own sack/bag for storage so to say that it doesn’t come with its own sack shows that you have not truly reviewed these items nor have you done proper research. It’s sad to see people like this put up these reviews without doing real research in to the products. It would be better for Melody to send her review request to a legitimate review site verses these guys who clearly don’t even look at the products they supposedly reviewing. I have been hammock Camping for years and have several under quilts and find that most of them have a very similar setup. To say that some are harder or easier to setup is silly. Truthfully you should review videos for which ever brand you intend to buy to understand the best ways to set up you’re under quilt prior to the first setup. Once you see it setup once and then do it for yourself you will find that there is no real difficulty setting these up. I would have liked to have seen a wider range of product testing or really any product testing at all. I could compare the price and the weight of them on Amazon without your affiliate link and have just as much info as I have after reading your “blog”. I’m sorry if my comments aren’t all warm and fluffy.. But readers should know that the data your displaying is incorrect and your recommendations are just silly… The Snugpak is one of the heaviest under quilts but what makes it hard to handle?? It’s no bigger than the Vulcan Under quilt when compressed and you didn’t say that that one was “Hard to handle”??? I guess I am having a hard time understanding your line of thinking or how you are qualifying these comments. And in multiple places you miss quote or misrepresent given information about the items i.e. in one place you say it weighs a set amount and in the pro’s and con’s you say it weighs something different. I would guess that at no time has the author looked at each one of these ether one at a time or all of them side by side. As someone that is constantly trying to improve my gear and have the best that I can afford it is beneficial to get real world reviews about these products and see if it’s worth spending money on a new item. But when you can’t through the first “review” without finding errors or inconsistency’s it makes it hard to believe anything else the writer has put in the post. I would hope that the data I have taken the time to post in my message would be reviewed and the above Blog fixed and all the errors removed. There are several more inconsistency’s and many more inaccurate pieces of data here that I did not talk about. If you desire a complete list of problems with this post, I would be happy to help correct it but as of right now I would steer away anyone looking at buying an under quilt from using this site as a reference.